Our friend, Harshad, often laments the lack of tea places in Mumbai in comparison to the multitude of coffee shops here. India is a nation of tea drinkers he argues and there should be options for them to sit and try out different teas in he says. 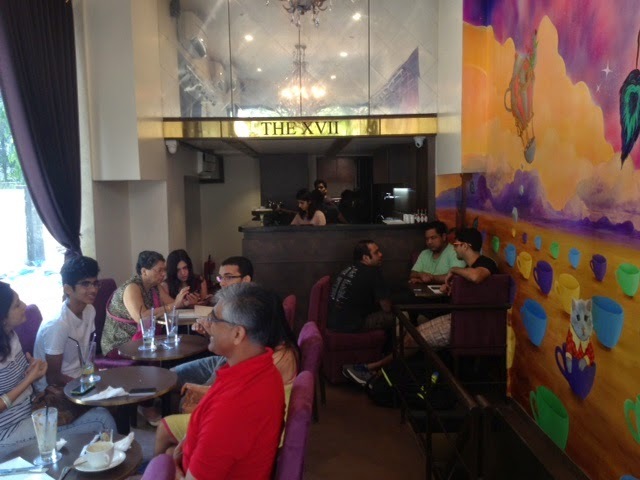 We thought of him when we went to the less than a month old, XVII The Tea Room, at Bandra’s Perry Cross Road (Opp Kotak Bank) last Sunday. My mom in law, K and I went there to try out the place for breakfast. Neither of us is much of a tea drinker though. The place looks like an elegant drawing room with lots of purple around. There was a large group of about 6 which occupied most of the seating. We found a table for two and they added a 3rd chair. The place is not that small as they have a basement section too. And they have free wifi which makes it a pleasant place to sit in and work too. Big windows give a bright feel to the restaurant. The service was a bit rough that Sunday. Viveka, one of the young owners, was manning to counter herself. She ran from table to table with a harrowed look telling people that the pancake batter was over and was being replenished. That seemed to preoccupy her and we had to wait a while for our order. The wait was worth it. They make their food fresh here unlike in coffee shop chains. The food is only vegetarian though barring the pancakes which have eggs. Interestingly they give you options of small plates, which we ordered, and large ones. This made it easier for us to try out different dishes. 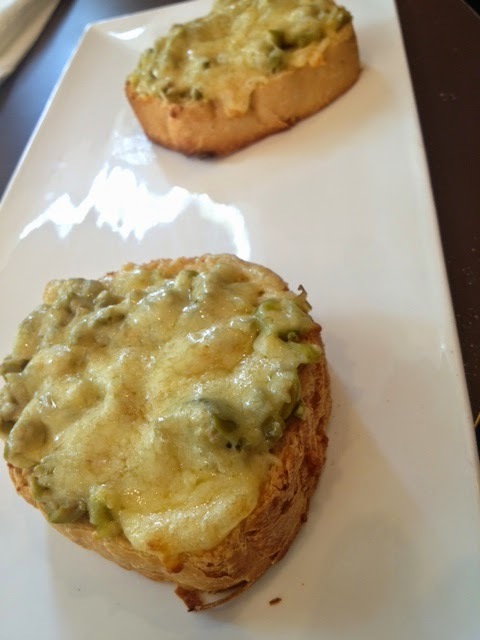 The cheese chili toast was served on warm, crisp outside and soft inside, bread which was really tasty. The cheese topping was generous and consisted of good quality cheddar and they used jalapeño peppers which added a tangy yet fiery kick to each bite. The other dish, olive tapenade bruschetta, was served on the same, lovely bread, with a restrained (compared to the decadent cheese toast) olive topping. My mom in law loved this too though I felt it to be a tad sour and sharp. Perhaps I am not an olive tapenade person. 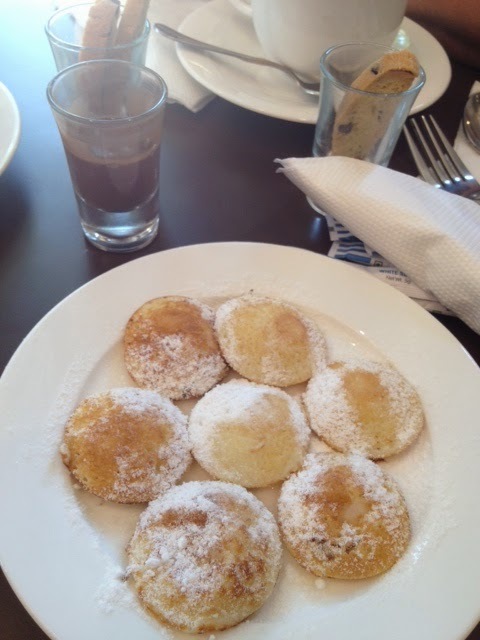 We tried out the much touted Dutch pancakes. These were served as small idli like discs. Had a pleasant mouth feel, was buttery and had a nice spring to them. We asked for plain pancakes with chocolate sauce on the side. The two went together very well and what I liked was the perfect balance of sweet in the pancake which had just the right touch of savouriness. 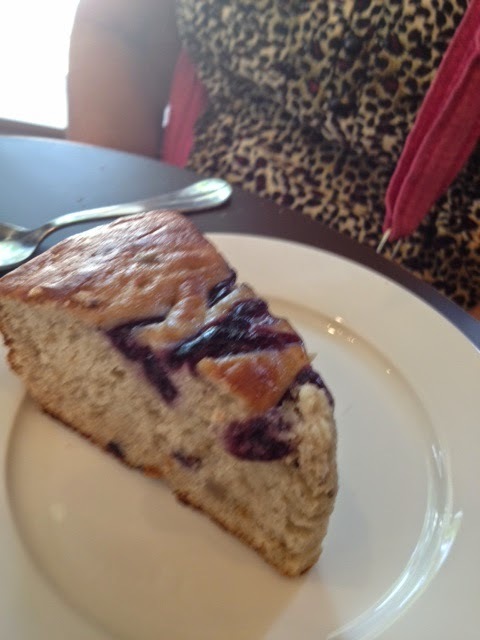 As our order reached us late, Viveka sent us a lovely blueberry teacake on the house. It was delightfully moist and the blueberry flavour was very pleasing. Viveka told me that XVII has been set up by her and two other friends who came up with the idea while studying in Paris. They don’t have a background in the hospitality business. One of them, I gathered, belongs to a family that trades in tea or owns tea gardens. They source their teas from gardens in South India and the auctions at Siliguri Devika told me. 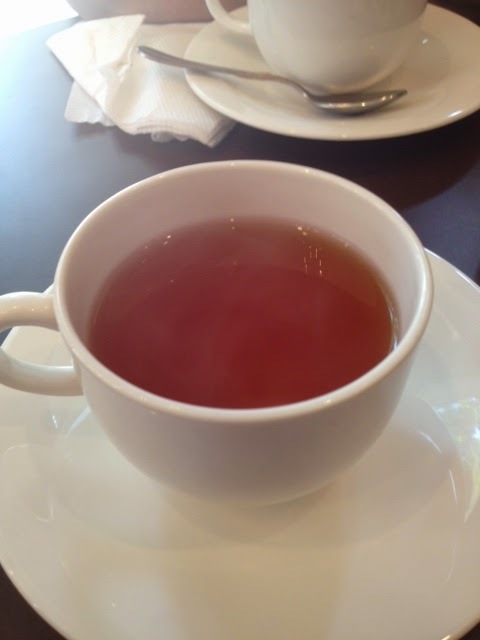 I tried a Darjeeling tea and quite liked the flavours and aroma even though I am more of a coffee person. K had a latte which she was satisfied with. They don’t serve cappuccinos here. That's a bummer as I like my coffee strong but then, in their defence, it's a tea place. My mom in law had the hot chocolate which she found watery in comparison to her favourites at Starbucks, Birdsong and Suzette. K declared the chocolate was of good quality though. I guess it is best to stick to the teas in a tea place! K went back a couple of evenings later with Harshad for a work meeting to XVII. I dropped in to check how they found the place. That evening looked busy too but this time I was told the service was prompt. Harshad had two teas, saffron and orange I think, and K had the white tea. They were quite happy with their orders. They went for the olive bruschetta and the cheese chili toast too and were quite happy which speaks of good consistency. We were quite impressed with the pricing. On Sunday we had 3 drinks, a pancake and 2 small plates while K and Harshad had 4 drinks and 2 small plates during their visits. Both times the bill was about Rs 660 which compares favourably with cafes here. Unlike the trend these days, they don't charge a service charge. Seems like they have a good thing going at the XVII Tea room. K and I went to the Tea Room on Sunday evening. It was fairly crowded but service was quick. This time we tried two green teas. One with spearmint and the other brewed with jasmine. Both had a lovely flavour to it. The jasmine one reminded one of Thai spas! We tried a small plate of the Mediterranean sandwiches. Thin sandwich bread with the edges cut with hummus, tomato, mozzarella, basil and olives in between. I quite liked it as it was a light bite and the flavours quite well balanced. The bread was a tad dry but Viveka said they are looking into it. Sometimes you want something light to munch on in the evening and this fit the bill. 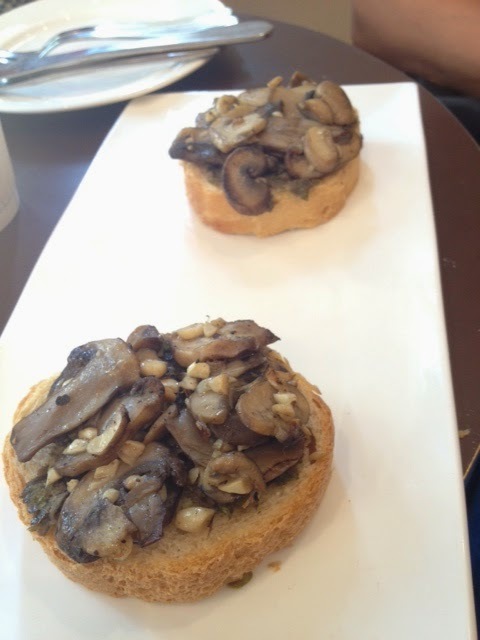 K said she preferred the mushroom bruschetta and the cheese chilli toast more though she liked the med sandwich. It worked pretty well for me though. The creaminess of the hummus won me over.